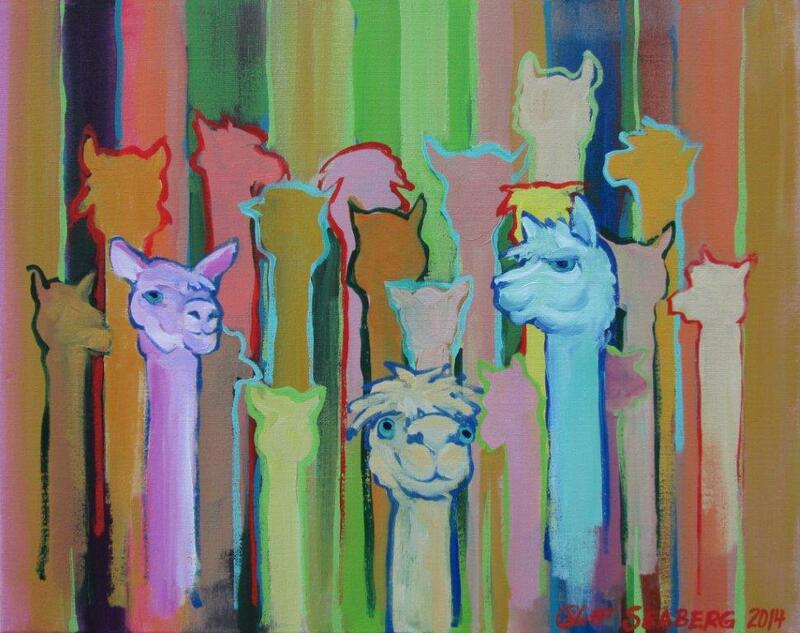 From Alpaca to Art. Painting per day helps raise funds for non-profits. This year, Jeff Seaberg, a Pembroke artist, alpaca farmer and bed and breakfast proprietor is creating one original painting every day and giving 10% of sales to charity in memory of his fellow artist, and friend Jim Falck. Most recently, the World Vision charity, dedicated to preserving children lives worldwide, was a recipient of a $100 check signed by both Jeff and the buyer of the painting. Thus far, he has painted over several dozen canvases. A fine art degree from Montserrat College of Art in Beverly, Massachusetts, experience drawing caricatures in San Diego, California, and using his art to teach English in Costa Rica all serve as the foundation of Jeff’s artistic perspective. Now married with four children, Jeff works from his home studio where he runs an alpaca farm and a bed and breakfast, in Pembroke, Massachusetts. Art mimics life and part of Jeff’s life is the Alpaca farm. These exotic and cuddly creatures have become a regularly occurring subject matter of many of Jeff’s pieces, including “Alpaca Pez” which depicts exactly that– an Alpaca head fixed on a Pez candy dispenser set on an abstract multicolored background featuring long wide strokes and thin lines that highlight. Hens, Honey Bees, and Peacocks share the spotlight with the alpacas on the farm and canvas in other works like “Bee Friends” and “Blue Chicken”. Jeff’s collections of paintings are available in print and original are available from his FineArtAmerica.com account [www.jeff-seaberg.artistwebsites.com]. Stay up to date with every daily painting from Jeff’s “Painting a Day, Art Explosion 2014” at the Facebook page [www.facebook.com/jeffseabergart] for the project.